JACO clinics are located in the most modern medical specialty buildings in the state! 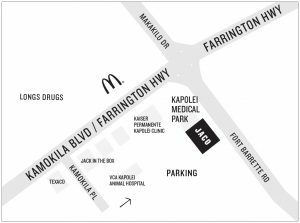 Kapolei Medical Park is our newest and fourth location conveniently located in Kapolei! We are located in the Kapolei Medical Park Building, next to the Kaiser Permanente Clinic. Parking is free and can be easily accessible by turning into the street between Jack in the Box and Texaco. Once there, make a left until you reach the end of the driveway and see the Kapolei Medical Park building.